In our Gazelles Coaching of the Rockefeller Habits discipline is a critical element to your business’ success. At Positioning Systems we’ve identified the essential execution disciplines as Strategic Discipline. That’s why Verne’s launch of Scaling Up changes to The Rockefeller Habits Checklist are important for you and your company to recognize and make sure you’re achieving in order to move your business toward greatness. Here are some of the changes Rockefeller Habits Checklist has evolved to. #8 Clear understanding of the firm's market position drives strategic planning and sales and marketing has been changed to read: Employees can articulate the following key elements of the company's strategy accurately. Each of the 10 Rockefeller Habits Disciplines now has 4 bullets to help clarify and identify whether this specific Discipline is being closely adhered to. 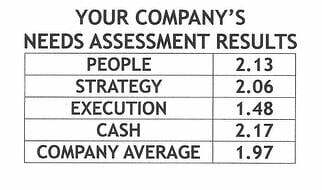 These bullets resolve many of the questions you may have on how to score your business when judging the Discipline. With four bullets to define each Discipline you may wish to weight each bullet at 25% of your score. Most importantly there should be no confusion any longer on whether or not you and your team hits the target with any of the disciplines. The bullets for each Discipline provide specific actions that your business should be taking. If you have any reservations on the value of the Checklist please download the checklist and watch Alan Rudy’s video on the landing page. In addition read Execution – Alan Rudy’s Success Story. Not only did Alan Rudy transform Express-Med into $65 M from having fights in the parking lot, employees slashing tires. Rudy has since sold Express Med and has since taken a $7M company to $1.2 billion in sales in just three years at the same time achieving the highest customer service rating in his industry. Rudy is currently resurrecting a $100 M company that was hemorrhaging cash. 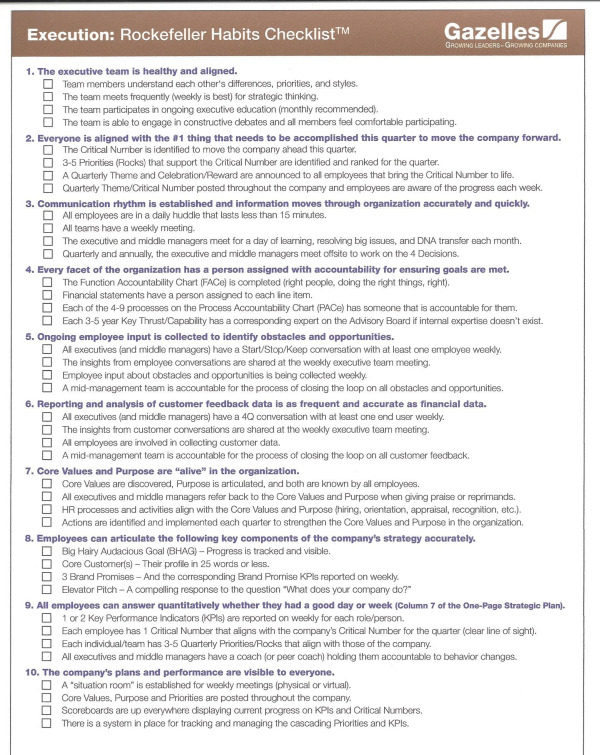 The Rockefeller Habits Checklist is a tool to have your leadership team review and score at least once a year. The best performers have unparalleled discipline, which includes preparation and planning. Verne doesn’t like to compare business to sports, yet we all know that in business and sports, preparation, practice and discipline play critical roles in success. Legendary Alabama football coach Bear Bryant stated, “It's not the will to win, but the will to prepare to win that makes the difference.” Basketball legendary coach Bobby Knight said it similarly, "The will to win is not nearly as important as the will to prepare to win." In Verne’s January 20th weekly newsletter he offered a leadership lesson from the Seahawks vs. Packer game, specifically noting Russell Wilson’s confidence despite throwing 4 interceptions to get the job done in overtime because, “I’ve done the work.” Has your business and leadership team taken the time to determine how disciplined you truly are? Have you taken the time to sharpen the axe? Having scored your Rockefeller Habits Checklist from 0-10, discuss which Disciplines you need to work on. Decide which can impact the business the most. This discussion may be invaluable in determine your One Thing for the year or Quarter. Is this enough reason for you to check out the new Rockefeller Habits Checklist? Sincerely hope so! My attention is focused on relationships lately, and in Brian Tracy’s Psychology of Achievement he outlines why Attention is one way we show others how much we value you them. With cell phones occupying so much or our time, texts, Twitter and real time immediate responses commanding so much of our time I believe attention is more important in building superior human relationships than it’s ever been. Next blog Attention, how to listen better and why something Tracy calls “the boomerang” can improve your self-esteem, professional, and personal relationships.